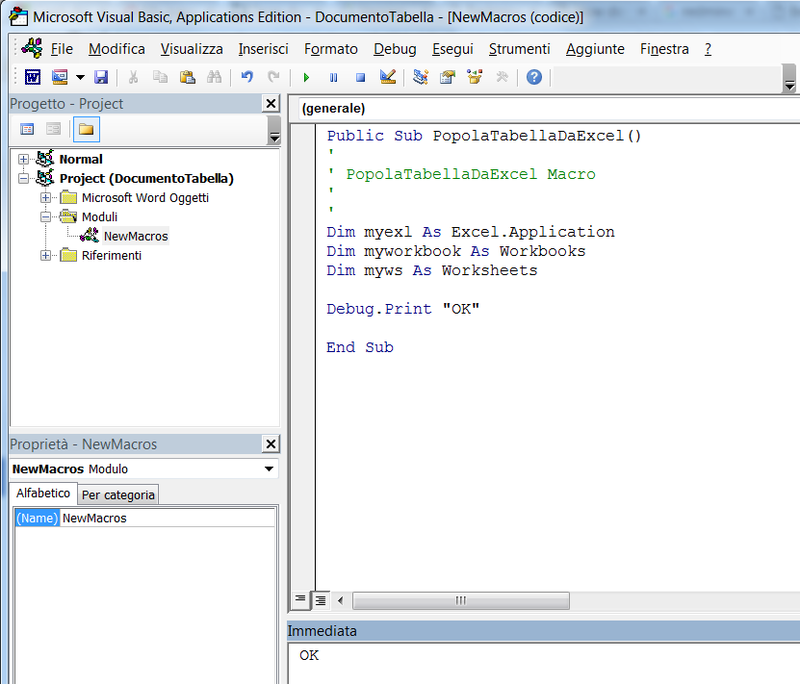 In today’s post we see how to create a macro in Visual Basic for Application that allows us to automatically populate a table in a Word document using an external Excel worksheet as data source. We also create an Excel spreadsheet that contains the table with the data we want to export in the Word document. 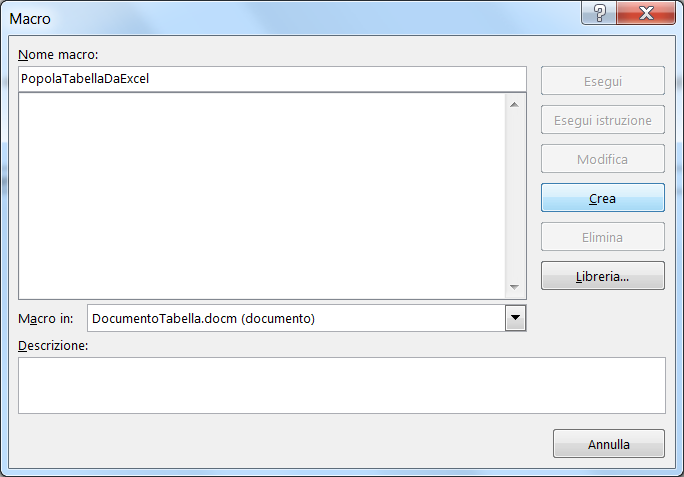 Also in this case we insert the header row, which will contain the same column names of the related Word table. At this point we have to write a VBA macro that will perform the operation. 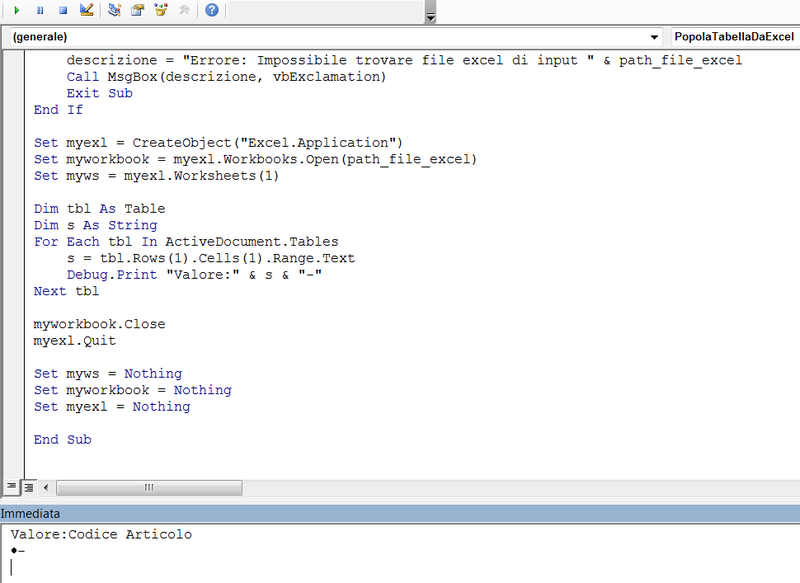 So we enter the VBA editor, and we are almost ready to write the macro code. First, however, in order to be able to work with Microsoft Excel objects, we need to add the relevant reference. To do this go into the “Tools” menu and select “References”. 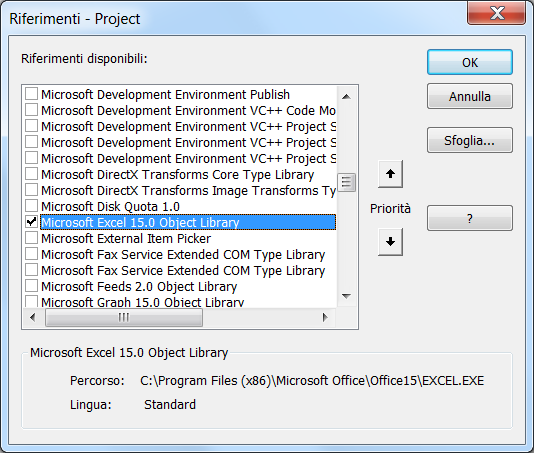 Scroll down the list until you find the “Microsoft Excel 15.0 Object Library”, select it and then press “OK”. At this point the Excel objects library is available and we can define an Excel application or a worksheet. Let’s try, for example, to insert the following code in the body of our macro and run it. If we run it, we get in the output window the result “OK”, a sign that there were no errors. So, we add again the reference to the Excel library and continue. Setting the “path_file_excel” variable to the correct path of the Excel file, we still get as output the string “OK”, a sign that there were no problems. Debug.Print "Here we have to put the code that extracts data"
Even at this point, we do not get any error. Now we can finally focus on the logic for data retrieval. 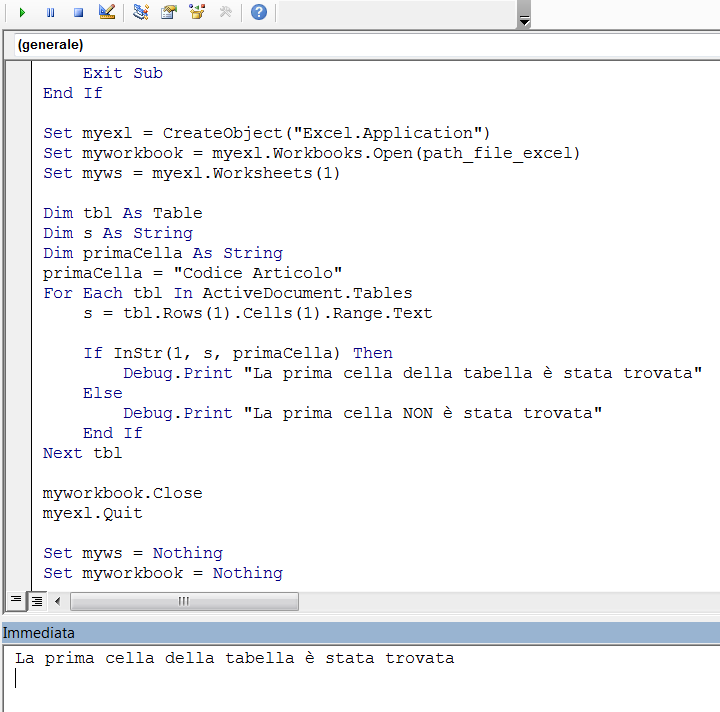 What we do is loop through all the table type objects in the Word file and check if the text in the first cell of the table corresponds to what we’re looking for. Once identified the table we want to fill, we start to iterate the cells from the following line, moving to the column on the right until we find an empty cell and going down line by line until we find again an empty cell. In case in the Excel file there are no data for the table we are looking for, we point out an error. 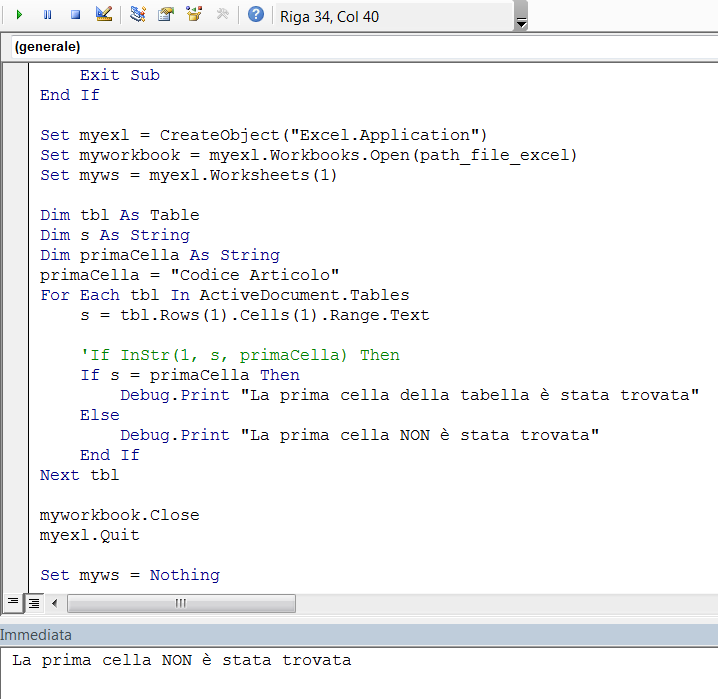 Debug.Print "Valore:" & s & "-"
Debug.Print "Value:" & s & "-"
we print in output the value of the variable “s” that is the first cell of the table header in the Word file. We add a “-” char just to verify what’s the exact value and to check that there are no special chars at the end of the string. As we can see, to separate the end of the string from the “-” char are present both a carriage return and another special character. This is despite in the relative cell they are absolutely not present. We must therefore take this into account when we go to perform the comparison between the Word table, and the search string. For simplicity, we now define a variable that contains the string with the content of the first cell of the table that we want to fill and that we have to search in the first column of the Excel file. This value, in order to generalize the procedure, should instead be passed as a parameter. Based on the test performed earlier, the strict comparison of equality between the two values fails, because of the special characters that we had identified. Debug.Print "First table cell found"
Debug.Print "First table cell NOT found!" we get the result shown in the following figure, which indicates that the cell containing the string “Codice Articolo” was not found. 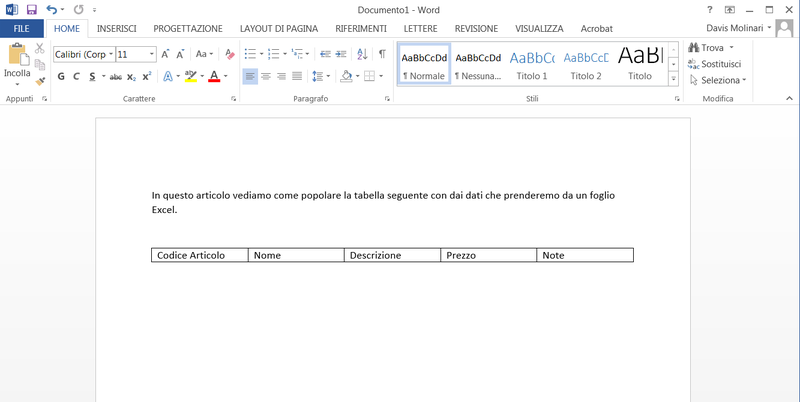 To overcome the problem of special characters, we can use the Instr function and, instead of looking for the exact match between the two values, we check that the text contained in the Word table cell starts with the value we’re looking for. Then we define a boolean variable we use to keep track of the fact that we found or not a table where the value of the first cell is what we’re looking for. Once identified this table, we have to check if in the Excel file are available data with which to populate it. We then use a second Boolean variable to store such information, and to report an error in case of the excel does not contain data for that table. At this point we have to process the Excel files in order to get the data and we will do it in the second part of the tutorial.. 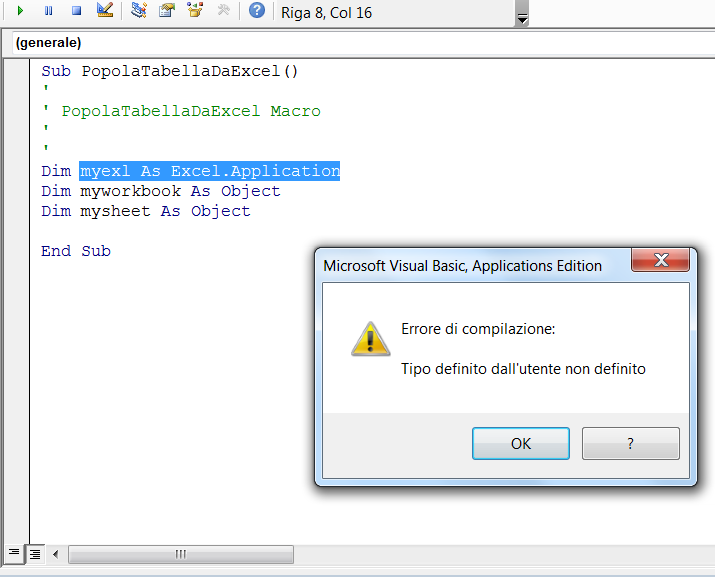 This entry was posted in Excel, Programming, VBA, Visual Basic .NET and tagged Macro. Bookmark the permalink. I have 0 knowledge about VBA, just some tutorials I watched via youtube.